Children of Vietnam is a non-profit that serves the children in the Da Nang and Quang Nam area of central Viet Nam. Through donations and fundraising work they provide infant formula and needed medical treatment for kids in both the Home of Affection and the Quang Nam Baby Orphanage where we volunteered. 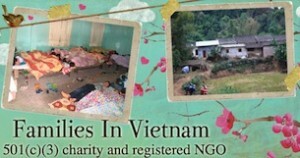 Ten percent of the profits from our campaign will go to Children of Vietnam to be used specifically for those children. Families in Vietnam works to help families in Vietnam as they struggle with health issues, including drug addiction. We worked with them to bring letters to and handmade jewelry from Vietnam to support their work. They accept donations on their website and are a non-profit organization. When we return to Vietnam, we will coordinate with them for any stateside needs or vice versa. Alternative Gifts International is a non-profit that sells “gifts” of donations to various projects. One that is near and dear to my heart is the Empower Women and Their Children project that helps single mothers start businesses to support their children.